Joe Grillo, former President & CEO of HID Global (which accumulated majority worldwide market share of the access control card reader market with revenue of $750 million), William West, former Global CFO of HID Global, and Steve Wagner, former Vice President of Business Development and COO of HID Global together formed Access Control Related Enterprises, LLC ("ACRE") to pursue other access control related opportunities. Upon entering into an engagement, M&A Capital both assisted the team in: (i) identifying all known acquisition targets and ranking them by strategic fit and ability to acquire and (ii) raising the most accretive capital. After considering many sources of capital, the ACRE team ultimately selected Mercury Security Corporation ("Mercury") as its primary target and Prudential Capital to provide the majority of its capital. It raised equity capital by partnering with LLR Partners, a private equity firm with specific access control related knowledge, to acquire Mercury. The acquisition of Mercury extended ACRE's security control panel platform. Earlier in the summer of 2012, ACRE had acquired the SMS' security access control business from Ingersoll Rand. According to Will West, "M&A Capital enhanced ACRE's speed and effectiveness at raising equity on favorable terms." 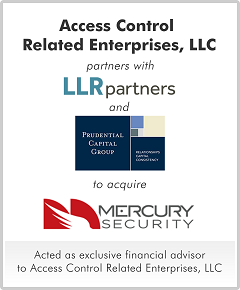 Founded in 1992, Mercury is the largest independent provider of access controllers in the United States. Mercury's controllers, readers, and embedded technologies lead the security business in performance, reliability, adaptability.